A group of dowsers gathered at Arigna, Co Roscommon, Ireland in June 2000 to construct a stone circle and measure its effect. The site was on the edge of a sprawling village surrounded by barren mountains, lochs and the remnants of Ireland’s coal industry. The owner of the land had asked Billy Gawn to find drinking water in the area. During the search it became clear that there had probably been a stone circle nearby. Several large stones were found buried in reeds and other stones were found on a neighbouring property. Excavation work at the site revealed further stones that could be used to construct a circle. With the encouragement of the owner and offers of food and accommodation, 12 people with various skills met for a week to build the new stone circle. The reason for building the circle was to see if it would neutralise detrimental energy in the area. Day one was devoted to finding and marking the positions for the stones. These were to be as Billy has found them at ancient sites – located over the large, deep underground water systems. The first task was to locate and mark the various deep streams that crossed the site. It was found that there were eleven in total. Five had their source as blind springs, which were some distance away and six were from downshafts. Detrimental energy normally rises from the edge lines of the streams from blind springs and from the centre line of the downshaft streams. Our plan was to place stones where these lines intersect to earth this detrimental energy. All the edge lines and centre lines were marked with short trails of white powdered lime. Wooden pegs were driven into the ground at the crossing points. In some places there was a simple crossing of two lines. In other places many lines met at a single point and in a few cases lines passed very close to each other leaving a small triangular or polygonal shape at the crossing point. The complexity of these crossings determined the size and shape of the stone that was to be erected at each point. Once all the lines had been dowsed and marked we discovered that there were 17 crossing points forming a circular shape of about 60ft diameter. The pegs marking these crossing points were measured and recorded on a plan. Whilst the overall shape was close to a circle, the distance between the pegs (crossing points) was far from equally spaced around the circle. The most complex crossing points appeared to correlate with the cardinal points. There were major crossings at due east and west and complex polygonal crossings positioned a few degrees from magnetic north and south. The triangular crossings created some interest as they formed a “bow wave” angle between edge lines. Whilst the energies within and around the circle were being measured, the younger members of the team set about distributing barrow loads of packing stones near to where the socket holes were to be dug. The position of each stone was marked with corner pegs and its size estimated. The shape of stone required to sit over each crossing point varied enormously. Some of the major crossing points required a stone with a square base whilst others needed a long and thin base. For example, the north stone which was to sit over an elongated polygonal crossing had to be 5ft wide, whilst stones over simple crossings managed with a base as short as 2ft. Each of the seventeen stones was selected and marked with its number. The largest stones were over 8ft in length (height when standing) and weighed over 2 tons. We were very fortunate in having a JCB to hand for moving the stones as without mechanical help it would have been a major task. The task for day two was to start erecting the stones. Tommy the digger driver was an expert with his JCB and a pleasure to work with. The digger first removed the turf and top-soil then carefully dug a hole to the required shape and depth. Large stones were manoeuvred, by fixing chains around them. The smaller stones were carried across the bucket of the digger. Large planks of wood were used to guide each stone into the hole and adjust it to the correct position. The location of each stone, in relation to the crossing points, was carefully checked by Billy. Smaller stones and gravel were then packed around the base to hold it securely in position. Work commenced with the south stone just after 9 am. In less than 2 hours the four large cardinal point stones were in place. Each quarter segment of the circle was completed in turn following the same process – dig hole, position stone, check alignment, pack securely. By lunchtime 12 stones were in position. The first stone after lunch made us realise that building a stone circle was not always easy. This particular stone refused to be placed in the correct position. As we had all had an alcohol-free lunch we were convinced it was the stone playing tricks rather than us. Eventually the stone relented and agreed to sit in its prescribed position. The final stone was placed and secured just before 4 pm. Some minor adjustments were made to the alignment of a couple of stones before the digger replaced the topsoil around each stone. After deepening the course of the stream that ran around the edge and regrading its banks the final piece of construction work began. This was the building of a dolmen using three uprights and a large triangular slab of stone. 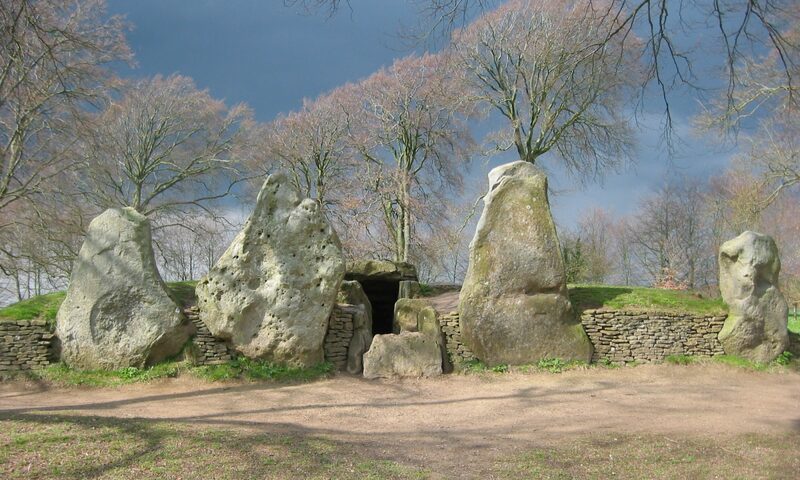 The dolmen was built over an ascending spiral of beneficial energy, using an angled capstone to reflect the energy back into a sphere within the chamber. It had the effect of acting like a transformer, which boosted the local supply of earth energies. Everyone who sat within the dolmen found it a very relaxing and peaceful experience. Rain greeted us on the third day, which made work on site difficult. Physical work consisted of completing the back-filling around the stones and relaying turf. There was also a first attempt to record the changes in energy patterns within and around the circle. Bad weather led to the abandonment of further dowsing until later in the week (day 4) when we were able to check the energies more thoroughly and conduct a small ceremony to protect and open the circle. A full write up of the energy findings will appear later. The main discovery was that at the end of the first week the energy effect of the circle had spread about 3 miles into the surrounding countryside, neutralising detrimental energy within that 3 mile ring. Indications are that the effect of the circle is still spreading. The finished circle is hard to distinguish from the real thing. We playfully thought about placing an antler pick under one of the stones to puzzle future investigators. Some interesting features appeared by accident. For instance, the line across the circle looking from stone 16 over the top of the eastern stone was observed to align with sunrise at the summer solstice and the line from the north to south stone appears to align with true mid-day in western Ireland. Our digger driver, Tommy, who was a sceptic at the start of the week, began to believe that we were onto something after Billy had tried a kinesiology test on an edge line and managed to push his arm down using one finger. In a very short space of time it is possible to construct a stone circle that removes detrimental energy and may bring benefit to people, plants and animals across a wide area. The Arigna circle was 60ft in diameter using local stone weighing up to 2 tons each. The speed with which the circle was built probably deserves a place in the Guinness Book of Records. I doubt if it could be repeated. We were fortunate in having an expert leader in Billy, a very good team of willing workers, first class dowsers, an excellent digger driver and perfect weather for the two critical days.